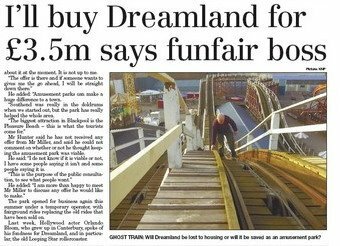 According to a report in Kent On Sunday this morning, Essex leisure park entrepreneur, Philip Miller, say's he'll buy Dreamland for £3.5 million. He is also quoted as saying: "There's nothing happening about it at the moment,it's not up to me." what do the TDC make of it? If the council were interested it would happen. Will the prospect of redevelopment the site is worth substantially more. It's shameful that our councillors have let the situation come to this. I hope they all get voted out for choosing the infamous Option C.